Habit: Plant < 1.5 m. Stem: nodal spines 0. Leaf: odor spicy; blade 1--4 cm, round, shallowly lobed, finely toothed, adaxially glossy. Inflorescence: 3--7-flowered. Flower: hypanthium 6--8 mm, > 2 × longer than wide; sepals 1--2 mm, reflexed, white to pink; petals < 1 mm, white to pink; stamens inserted below level of petals, anther tips with cup-like depression; styles fused +- to tip. Fruit: 6--7 mm, red, glabrous to sparsely glandular. Chromosomes: 2n=16. Leaf: hairs 0 to dense, glandular. Inflorescence: bract tip wide, with several prominent teeth. Flower: styles generally hairy. 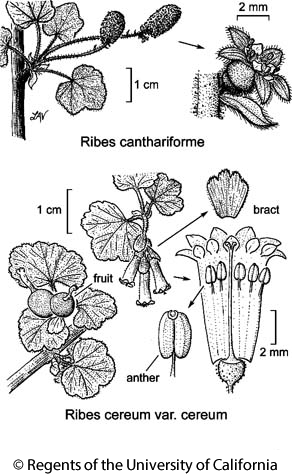 Citation for this treatment: Michael R. Mesler & John O. Sawyer, Jr. 2012, Ribes cereum var. cereum, in Jepson Flora Project (eds.) Jepson eFlora, http://ucjeps.berkeley.edu/eflora/eflora_display.php?tid=65130, accessed on April 21, 2019. KR, CaRH, SNH, Teh, TR, SnJt, GB, DMtns; Markers link to CCH specimen records. Yellow markers indicate records that may provide evidence for eFlora range revision or may have georeferencing or identification issues. Purple markers indicate specimens collected from a garden, greenhouse, or other non-wild location.